Written with Senior Meteorologist, Dave Gorham. The Northwest and Northeast Passages (sea routes across the Arctic Ocean) are prized for their shorter transit times between North America or Europe and Asia. The main caveat is that they have traditionally been blocked by thick pack-ice year-round. Warming global temperatures are now causing this ice to recede and thin, opening trade routes. Are these passages a bankable solution for commercial traffic or will colder temperatures return to close them? If the latter is the case, how long can companies take advantage of the passages before they close off again? Over the centuries of global trade, these two passages have gained near mythical status by sailors looking to avoid the long distances and dangerous waters of traditional routes (the southern tips of both South America and Africa are notorious for their treacherous navigation and hazardous weather). Completed in 1914, the Panama Canal shortened the traditional voyage around South America by nearly 8,000 miles. The Suez Canal, connecting the Atlantic to the Indian Ocean via the Mediterranean and Red Seas, saves nearly 5,000 miles by avoiding the route around Africa. An ice-free Northeast Passage (England or Northwestern Europe to Korea) could save more than 3,500 miles over the conventional Panama Canal option, while the Northwest Passage (North Atlantic to the North Pacific via the Beaufort, Chukchi and Bering Seas) could save as many as 2,500 miles. These would result in significant savings in distance and time, which equate to savings in transportation costs and fuel costs/emissions. 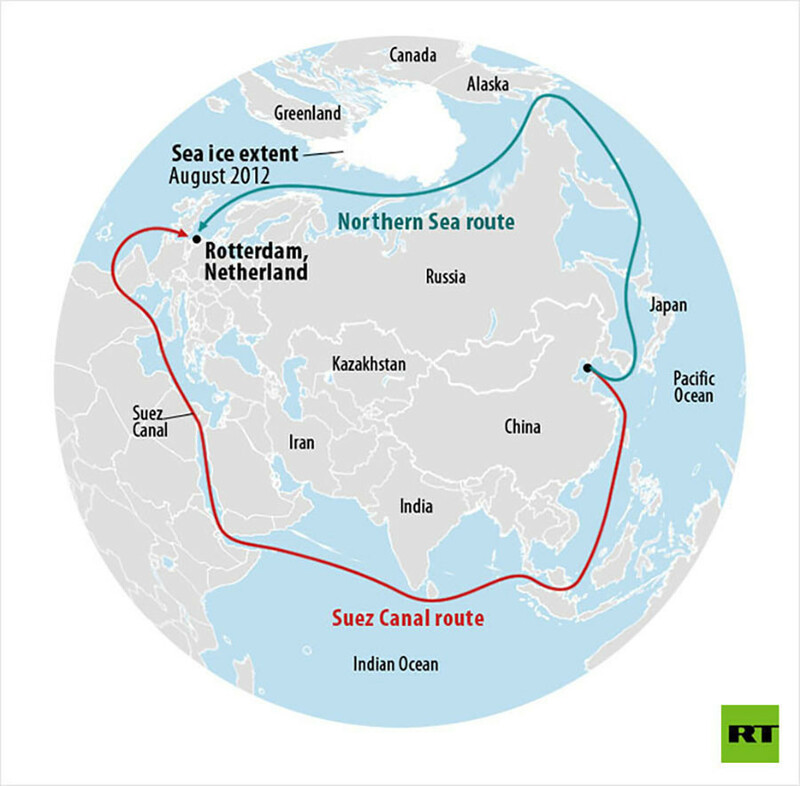 As declining northern sea ice over the past decade has made these routes more navigable, interest in the passages as viable trade routes has touched off political claims of sovereignty. Canada has claimed the routes as part of their internal waters, while the U.S. and various European countries have claimed them as international waters. According to the National Snow and Ice Data Center, the statistical average for pack-ice coverage in the Arctic is 6.3 million km2. Currently, the ice is rebuilding after thinning out over the summer, when it was at a low of 4.6 million km2, now measuring 11 million km2. While the summer amount is quite low, it’s far from the all-time lowest coverage of 3.4 million km2 recorded in September, 2012. For comparison, the maximum summertime coverage was 7.6 million km2 in 1980, although records only go back to 1979. Though there has been an overall downward trend in total coverage since 1980, there was a similar downward trend in the 1940s and 1950s, then followed by a rapid expansion of ice coverage in the 1960s. Scientists have looked into why this oscillation occurred, as well as if the decreasing pack-ice coverage of the 1990s and 2000s will go through a similar expansion in the coming years. Much like in the Atlantic and Pacific Oceans, where warm water temperature regimes can last for decades and influence tropical storm activity, these same cycles are also believed to impact the Arctic. Two noted cycles, the Atlantic Multidecadal Oscillation (AMO) and the Pacific Decadal Oscillation (PDO), push warm water northward — around Greenland, through the Bering Strait and into the Arctic Ocean — that can alter the typical water temperature profile for 30-40 years. 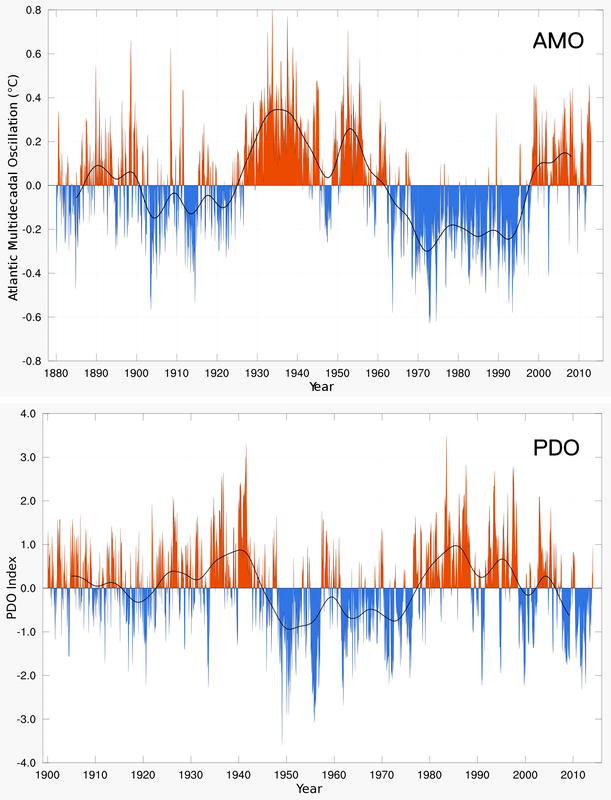 In the 1930s and 1940s, both the AMO and PDO were in warm phases, likely becoming the primary factors for the ice deficit during that time. During the 1960s and 1970s, the AMO and PDO reversed to a cold phase, allowing pack-ice coverage to increase until the early 1980s. The two oscillations again went through a warm phase in the 1990s and early 2000s. While there is currently no imminent sign of pack-ice reversal, both the AMO and PDO are beginning to show signs of returning to a cold phase, which could allow the expansion of Arctic sea ice in the years to come. That said, it’s important to note these decades-long cycles can have periods slightly out of phase with the cycle as a whole, and the 2018-2019 forecast is showing signs of a milder-than-expected winter. 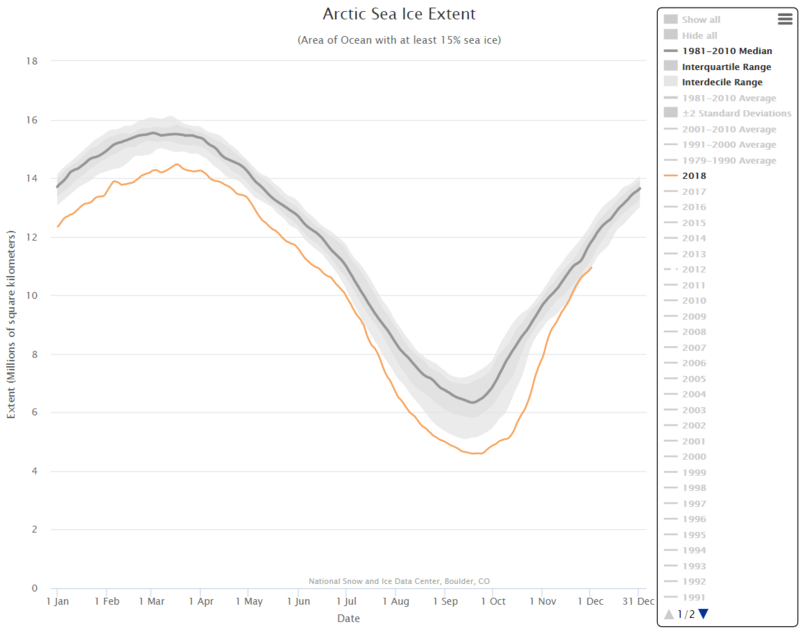 This will likely inhibit the expansion of sea ice that is typical in the winter months. In addition to the warm and cold phases of the oceans, the Sun also plays a role in the warming and cooling of the Earth. This is not limited to the seasonal changes made as the Earth orbits the Sun each year; there are actual changes in the Sun itself. The Sun goes through periods of maximum and minimum magnetic energy output, which last approximately 11 years. When combined with the expected weak Quasi Biennial Oscillation (QBC), which tracks stratospheric wind anomalies, Arctic high pressure is expected to be stronger than normal. This translates to a weaker than normal Polar Vortex — two more clues that favor a mild winter and a slower rebound of Arctic sea ice. With other factors at play, not the least of which includes global warming, what the future holds for Arctic sea ice is still in question. Measuring the extent of sea ice has only become accurate in recent decades, being a very rough approximation before the era of satellites in the 1960s. Early indicators, such as the AMO, the PDO, the solar cycle minimum and the QBC are pointing to a slow start to what could be a decades-long reversal trend of increasing sea ice. Previous insight: What is holding back digitalisation on the bridge? Next insight: Is Weather Routing Really Worth It?